¶ … human resource management techniques through the use of an interview with a human resource manager. The writer explores employee satisfaction, union issues and polices through the interview. 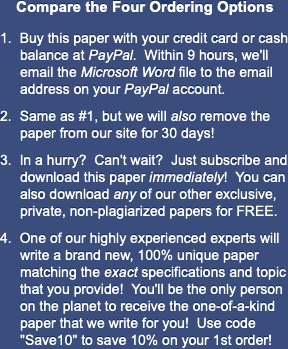 There were five sources used to complete this paper. Effective human resource management can mean the difference between a successful company and a company that fails to thrive (Wheeler, 2005). Employees that are carefully chosen, well trained and content in their jobs and benefits, provide better product and services that employees who are disgruntled and unhappy in their position. With the importance of human resource management increasing in value nationwide it is vital for human resource managers to understand the many elements of employee retention and satisfaction that they are charged with (Ferris, Galang, 1993). Today's workplace atmosphere is not just about producing product for the bottom line, but also incorporates encouraging and supporting the employee's in their outside lives. To this end it has become increasingly important to plan company events that encourage the social interaction of workers so that they begin to build bonds with each other, making them less apt to be come disheartened with their jobs. In addition the more like a family the employees feel the less chance they will seek employment elsewhere which helps strengthen employee retention. It is important to increase the company retention rate to converse training costs and other factors that make high turnover undesirable (Wheeler, 2005). Providing a supportive atmosphere for the nurturing of family and social ties within the workplace helps to build company morale which in turn helps human resources build the company (Harris, 2004). Another important aspect of human resource management is seeking out and obtaining qualified employees. The use of current technology enables searches to be much wider than they have been in the past and provides the ability to seek out the most qualified candidates (Leinfuss, 1993). Effective human resource management is a key factor in the development, growth and success of any company, whether it is a large company with an entire human resource department, or a smaller operation with the owner wearing the human resource management hat (Warech, 2004). Effective human resource management should be among the top priorities for any business in the country. One of the methods people learn best from is to talk to someone who is already successful in the field. Mentoring can be a valuable tool in the quest to master skill sets in a given field. With this in mind I conducted an interview with a human resource manager at a local company. I chose this particular manager because of the size, structure, and diversity of the company in which he is employed. I asked key questions of the manager so that I could ascertain elements of the job that are important for success. The interview target is a human resources manager at a company that employees 500 people. It is a unique company in that it is a manufacturing plant however, it also has a large sales and administrative support staff because of the national customer base. With this in mind I chose it so I can get a feel of the things needed to manage both a unionized and a non-union operation. This company provides the opportunity to study both as it has a union manufacturing department and a non-unionized administrative and sales department. The manager will be called Bob throughout the interview to identify his responses. Bob is 45 years old and holds a masters degree in the field of human resource management. He attended a well respected school and when he graduated he began his career with a small company in the Midwest that employed 50 workers. Bob was at that company for several years while he honed his skill sets and developed his human resource foundation to take with him to a larger company. His next position was for a company, also in the Midwest that employeed 200 people. His second position was in a company that had been unionized from the beginning. It was at this company that Bob developed the skills he needed to manage human resources with a union. Five years ago Bob came to this area and this company and has moved up to the position of human resources manager. He oversees the recruitment, hiring, retention, and termination of 500 employees. It is a manufacturing plant with a unionized factory floor and a non-unionized administrative and sales department. He manages a human resources staff of four employees whose primary function is to develop and implement the directives he gives them for human resource management. Are any employees in your organization unionized? Yes. We have a manufacturing department of approximately 400 employees. They are divided into several different functional areas and they work eight hour shifts. We have around the clock manufacturing which means the fist shift comes in from 8 a.m. To 4.pm, the second shift works from 4 p.m. To midnight and the third shift comes in from midnight to 8 a.m. The entire manufacturing division of the company is unionized. There are three different unions in the shop, the sheet metal workers union, the bindery workers union and the Teamsters union. We have a total of three union stewards who are responsible for representing the three different union concerns. To that end the union stewards meet with me once a month and voice concerns or questions that have been brought to them through their employee relations team. How do policies for unionized employees differ from those who are not unionized? The policies on the surface do not appear to be that different. Let me explain. When I first took this position I was concerned that the company was not effectively addressing the concerns of the non-union employees that we had. I believe one of the fastest ways to get a union into a company is to ignore the company employees. We already had a union in the manufacturing area, and I knew if we did not immediately address the non-union area of the company it was possible that those employees would look across the shop and begin thinking the way to be heard was to create a union. I knew we had to act on behalf of the employees so I began to design and implement programs that provided benefits and perks that were very similar to those of the union employees. With that said, the two sides appear on the surface to be extremely similar but there are several underlying differences in the way grievances and other issues are handled, depending on if it comes from the unionize areas of the company or the non-unionized area. When an employee in the union has a grievance or issue the company policy is for that employee to go to his or her union steward and voice the problem. The steward works with the supervisor, or management member to try and resolve it immediately. Failing to do so leads to the next step. I meet once a month with the shop stewards and it is during those meetings where unresolved issues surrounding union employees are brought to light. We work with the steward in a mediation styled setting so that we can develop a solution to the problem. If the employee with the grievance is from the non-union side of the company we have a procedure by which they are asked to first go to their immediate supervisor. If that does not resolve the problem to their satisfaction they are then asked to come into the human resource department and discuss the issue. We will set up a meeting with their supervisor, and anyone else who is involved in the issue. I have been through mediation training and I mediate the situation until we come up with a solution. To insure the fair treatment of all employees we have implemented the same absence, and tardy policies for the non-unionized workers that the unionized workers must adhere to. How does your organization create a positive employee relations environment? "Human Resource Management Techniques." 25 May 2006. Web. 24 April 2019. <https://www.essaytown.com/subjects/paper/human-resource-management-techniques/9226557>. "Human Resource Management Techniques." Essaytown.com. May 25, 2006. Accessed April 24, 2019.